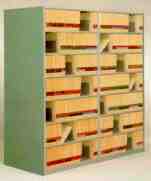 The concept of Mobile Storage - "Shelving on Wheels" - eliminates all those wasted aisles. A Systems Specialist from Penn Systems Group will survey your needs, and provide you with professional layouts and configurations to assure maximum utilization of floor space in keeping with your special needs. reduce personnel costs, and turnover. The Spacesaver Rotary File provides the greatest space savings possible. File retrieval time is reduced by making twice the number of files available in the same space as conventional filing systems. 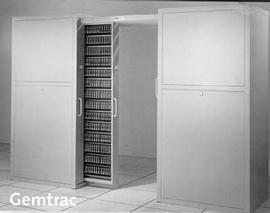 Two workstations may access the same file from positions on either side of the cabinet; ideal for sharing information on a continuous basis. Pass-through shelves create the ability to conveniently transfer information without leaving the workstation. Store 5,280 - 3480 cartridges, 11,200 - 4mm or 8,960 - CD's in just 25 square feet! Shelving offers the versatility and flexibility of a custom-designed and built storage area. Recommended for library book stacks, large parts and supplies, carton and box storage, and other miscellaneous uses where storage is necessary. 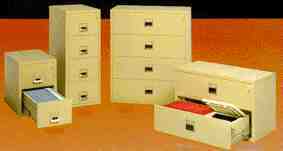 Complete filing solutions for microfilm, mirofiche aperture cards. 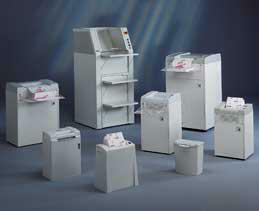 Document shredders from the lightest-duty size, to the most powerful, conveyer-feed shredder. Each model offers state-of-the-art engineering and dependable security.